At the heart of the Loire Valley, a few kilometers from Blois sits the majestic Chateau de Chambord, Heritage of UNESCO since 1981 and also public institution managed by the Ministry of Culture. This is a true wonder both historical and architecture heritage. The castle of Chambord is utterly recognizable. It is also a fortified castle although it was a castle made first for hunting (for the famous royal hunting), then became residential. He is truly among the three, which makes some of its uniqueness and its unusual appearance. A feature that may disconcert visitors. King Francis is responsible for the construction of this magnificent and imposing edifice. In the early sixteenth, Francis returned from an Italian campaign with the desire to build a home inspired by the most beautiful things he had seen beyond the Alps, especially in Tuscany or in Milan area. His eyes and memory are filled with images of ancient buildings, palaces, villas, scenery more beautiful the one from another. 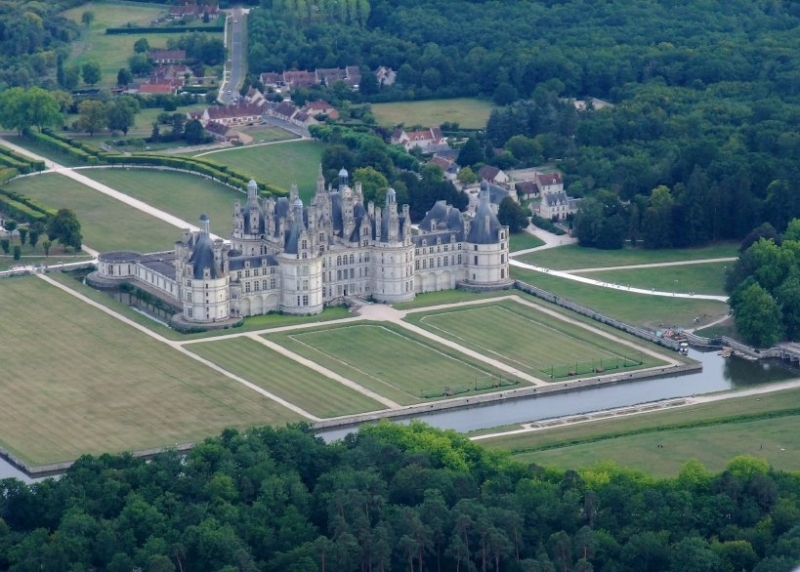 He chose the Sologne, a good place to hunt with its peaceful and huge forests, to build a typically Renaissance castle which will become the castle of Chambord. Construction started in 1519 and lasted many years. It must be said that the site is extensive. Indeed, what a castle ! One of the wildest projects before Versailles. It is true that it has impressive dimensions : four-hundred and forty rooms, two hundred eighty-two chimneys, seventy-five stairs, a wall of thirty-two kilometers long, 220000 tons of stones, etc.. These figures are enough to make you dizzy. It is true that the king does not do in a half-measure... The construction of this royal castle needed more than 1800 workers from all trades ... And it lasted for more than thirty years. Rigor in the construction and wealth in the ornamentation. 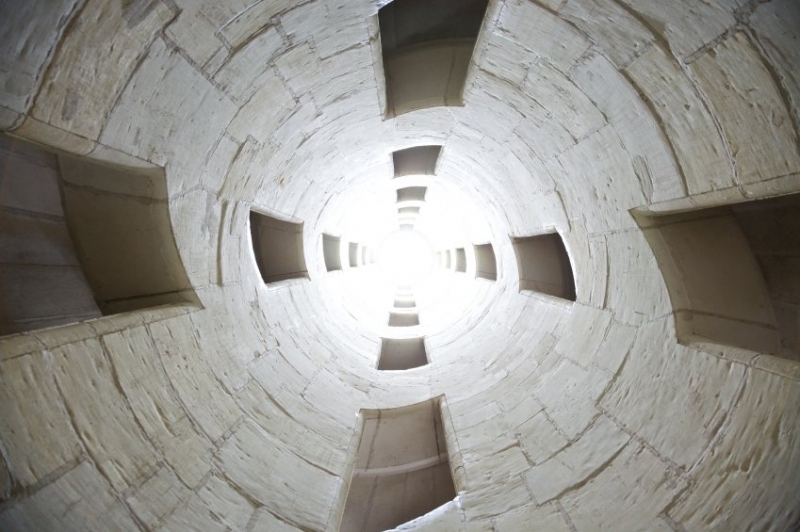 This is how we can summarize the appearance of the castle of Chambord ... So it has a romantic side. Yet, the architecture of the building has a classic medieval plan, much like a traditional castle. The basic plan is simple: an enclosure, four corner towers and moats. Chimneys, turrets, pepperpot roofs, gabled dormers, dress and ornament the roofs of the castle. As for the facades, they are decorated with scrolls (arabesque carved or painted), candelabra (shaped torch decorative element ) and other pilaster (pillar leaning against a wall). The decorations are inspired by the vegetation and intertwine. There is a reinterpretation of Italian Renaissance art... that adapts to the French taste at this time. And this mix is the singularity of the Chambord castle. The building plan is inspired by geometry : squares, diamonds, rectangles, circles, Greek crosses... Even the construction of the tower complies with these very arbitrary forms : it takes place in a square whose sides are precisely 45 meters, which can be divided into five elements of 9 feet each ... A real feat of architectural surveyor! It's solid, robust, but it is not as military as it looks. The facade, its ornaments, the surrounding park, add a touch of elegance which gives style to the Chambord castle. Although Francis had little stayed at the castle of Chambord, one of the most legendary Loire castles, he attributed, when he was living there, an appartment in the dungeon to the prominent members of his court. A good sized place, including a main room, a wardrobe, a workroom and an oratory. See also, the apartments, all similar, on three floors, including the royal chamber. And of course, do not fail to admire the beautiful Italian terrace with views over the rooftops of the castle and the surrounding panorama. However, originally the furniture was stark and reduced to its bare minimum : a wooden table, chairs, chests, which were also used as benches for sitting. The collections have been enriched over the centuries and the rhythm of the various people living there... But the castle retains a reputation as an "empty " castle... Today, some 4,500 items are nonetheless in the collection of the site, including a fine collection of wall hangings and tapestries. In the cabinet of Francis the first, converted into a chapel by Stanislas Lezynscki, is the pane where the king wrote with his diamond ring the famous little phrase that says much about his experiences in love "Women often vary, you'd be mad if you rely on them ! " National Estate since 1930, the site of Chambord is not only interesting for its castle... Its park should also be explored (national hunting reserve). The fauna and flora are protected in this area (the largest enclosed forest park in France) which covers an area of over 5400 hectares. Trails for bicycles, horses, walking tours, boat hire, tours in vehicule four-by-four, etc. ... the site can be discovered by all possible means, which allows children to have outdoor activities after the cultural visit of the castle. A good way to combine culture and pleasure. The castle is open to visitors every day between 9 and 17:15. Admission: 9.50 euros. Info: Set next to Chambord Chateau, this hotel is just a 20-minute drive from Blois. You can relax in the English-style bar or use the free internet on the computer in reception. 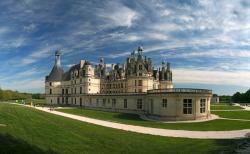 Info: Located in the village of Maslives, this 2-star hotel is just 3 km from Chambord Castle. It features a shaded terrace in the garden, and free Wi-Fi is provided in the guest rooms. Info: At the very heart of the Loire Châteaux near to Chambord, this renovated village inn offers a relaxing stay with a certain sense of 'bien vivre'. Info: Situated 6 km from Blois, not far away from the prestigious castles of the Loire, this Balladins offers en suite rooms with free Wi-Fi.